If you're like most people, you search the web a lot. Google handles more than 40,000 searches per second, or 3.5 billion per day, or more than 1 trillion searches every year. Your share of that may be small: if you're just an average person, you may search the web 3-5 times a day, but some of us, such as writers, may perform several dozen searches in a single day when researching articles and books. Searching the web is free. But nothing is really free. In exchange for providing you with such a powerful tool, Google collects data about you. It creates a unique profile of you, of your interests, your medical conditions (because _everyone_ searches Google when they have health questions), and your browsing activity, and uses this to provide carefully targeted ads. It also tracks the websites you visit, ensuring not to miss anything you do. In other words, using a search engine is the same as giving away lots of private information about you, your habits, and your life. You may not want to do that. You may even want to use specific search engines for certain types of searches. If you're searching for a job, there are several search engines you might want to use. For detailed medical information (for doctors and researchers), the Entrez search engine gives you access to specialized databases. And if you're a lawyer, you probably already know about LexisNexis, which provides access to statutes, laws and case opinions from 1770 to the present. Most search engines collect as much personal information as they can to build profiles of their users, which can then be used to better target advertising at them across the Internet. Have you noticed the ads that follow you and your kids around the Internet? That's the direct result of this collection. If you want less information out there about your kids, use sites like DuckDuckGo that don't track you. While you can easily visit any search engine's website to carry out a search—just type, say, bing.com in your browser's address field—it's easiest to use either the built-in search field, or the combination search and address field that browsers such as Safari and Chrome offer. To be able to use a different search engine than the default, you'll need to manually make a change. 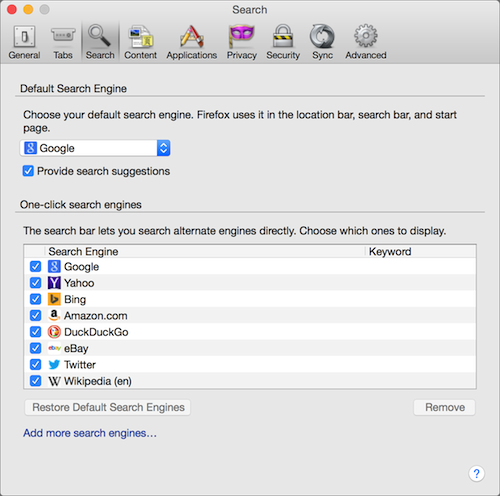 Here's how you do this for the three main browsers in OS X.
Safari: Choose Safari > Preferences, and then click Search. Click the Search Engine menu and make your choice. Safari lets you use Google, Yahoo, Bing, or DuckDuckGo. Firefox: Choose Firefox > Preferences, and then click Search. You can choose from a number of search engines that you can use when typing into the location bar, and set a different search engine to use in the search bar. Click Add more search engines to find Firefox add-ons that let you use other search engines. Chrome: Choose Chrome > Preferences, and look in the Search section of the Settings page that displays. You can choose from Google, Yahoo!, Bing, Ask, and AOL. If you click "Manage search engines…" you can choose other search engines as well, such as goto.com or duckduckgo.com. Additionally, if you set Google as your default search engine, you can enable voice search; in doing so, you can talk to your Mac and say "Ok Google" to start a voice search. You can switch search engines in iOS, too. Depending on the browser you use, the settings for this might be in the Settings app or in the browser's own settings. 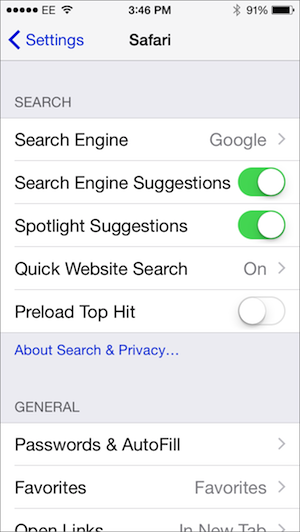 Safari: In the Settings app, choose Safari > Search Engine. 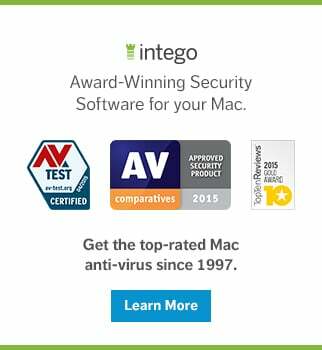 You have the same choices as with OS X: Google, Yahoo!, Bing and DuckDuckGo. Chrome: Open the Chrome app, then tap the menu button (the three dots) at the top-right of the window. 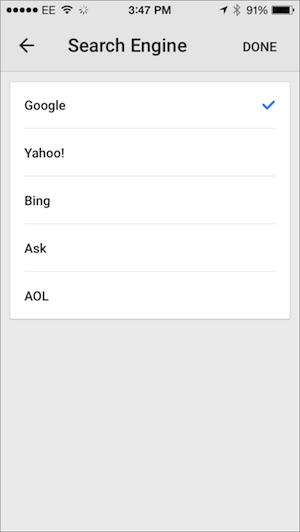 Tap Settings, and then Search Engine. As with Chrome on OS X, you can choose from Google, Yahoo!, Bing, Ask, and AOL. For other iOS browsers, check the settings for each one. While most people use Google for their searches, you need to be aware of what the implications are. Your searches are recorded, your activity tracked, and you're just another advertising target. While other search engines may track you to some extent, one in particular, DuckDuckGo, doesn't track you at all. 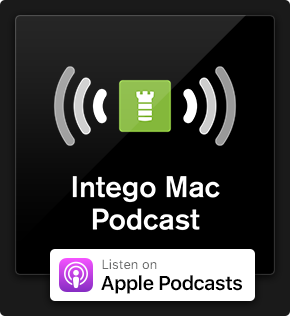 It's easy to change which search engine you use, both on OS X and iOS, so go ahead and try out another one, and see if it's good enough for your needs. This entry was posted in How To, Recommended and tagged AOL, Ask.com, Bing, DuckDuckGo, Google, GoTo, iOS, Mac, OS X, privacy, search engines, Yahoo!. Bookmark the permalink. The big issue that I’ve found is that these other search engines are miserable when it comes to searching by time periods. Some don’t even have the option! So, we’re stuck with Google–although Google itself keeps turning up old search results and it takes multiple steps to get recent searches. Plus, who wants the Big G playing e NSA on your searches? !